The Beatles' remasters are to make their stereo vinyl debut on 12 November (13 November in North America). The 14 albums, originally released between 1963 and 1970, will be manufactured on 180-gram vinyl with replicated artwork. As well as each album being sold individually, a limited number of 50,000 box sets containing the full collection plus a 252 page hardback book containing unseen pictures will also be available. 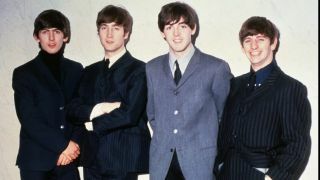 The remastered albums rocketed The Beatles back into the charts when they were released on CD in 2009, racking up album sales of over 17 million in seven months. This vinyl release is the result of a lengthy process at Abbey Road, headed up by Sean Magee, which utilised the original 24-bit remasters in order to maintain the best possible audio quality. Check out our extensive reviews of the 2009 CD remasters here (1963-66) and here (1967-70). "Love Me Do" (original single version), "She Loves You," "I'll Get You," and "You Know My Name (Look Up The Number)" are presented in mono. Packaging, notes and photographic content is based on the 2009 CD release.